Two post design with top mount oneway fill port. 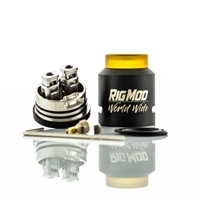 The VGOD Elite RDTA offers 4mL tank capacity and vacuum wicking system. This 24mm rebuildable drip tank atomizer sports a hybrid friendly protruding gold plated 510 pin. The Elite RDTA is completed by the engraved Elite RDTA shield on the cap.